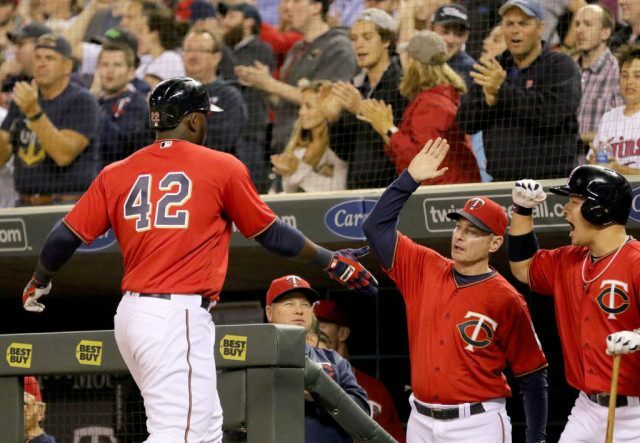 MINNEAPOLIS (AP) — The Minnesota Twins became the last team in the major leagues to win this season, after Byung Ho Park drove in the go-ahead run with a double in the eighth inning for a 5-4 victory Friday night over the Los Angeles Angels. Both Minnesota and Atlanta stopped nine-game losing streaks Friday. The Braves beat Miami earlier in the night. That left the 2002 Detroit Tigers with the dishonor of being the last team to start a season 0-10 or worse. Albert Pujols and Kole Calhoun homered for the Angels, whose four-game winning streak ended. Miguel Sano and Trevor Plouffe hit consecutive RBI doubles in the sixth off Angels starter Garrett Richards, the third multi-run inning for the Twins this season. This was the first time they topped three runs in a game, but they’re still last in the majors with 19 runs.